Everyone already knows that Tesla (TSLA: $345/share) loses a great deal of money and has massive growth expectations baked into its stock price (we’ve addressed these concerns here and here). Despite these obvious concerns, the stock has continued to soar on the hope that the company’s technological advantage will allow it to dominate the growing electric vehicle (EV) market and play a big role in energy storage. 2018 could be the year the market starts to see through this bullish thesis. In reality, Tesla’s technological advantage is slim or even nonexistent, and it’s facing a growing stable of competitors with more resources and more expertise. As competitors begin eating into its market share, Tesla won’t be able to keep distracting from its current problems by promising the next big thing. This increased competition, combined with a sky-high valuation, lands Tesla in the Danger Zone. 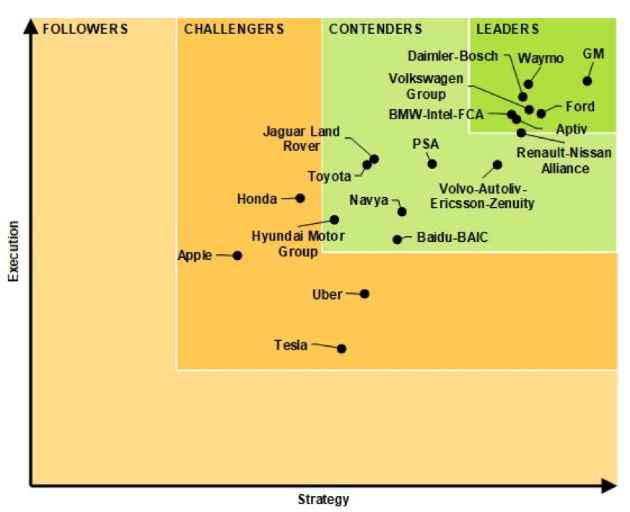 Tesla’s autopilot feature has been a big selling point of its existing car models, and the company recently announced that it’s producing AI chips that Elon Musk claims “will be the best in the world.” So naturally, when Navigant research analyzed the top 19 companies developing self-driving technology, Tesla ranked… dead last. Navigant sees Tesla as a distant challenger in the self-driving space, while the leaders are established car companies such as GM (GM) and Ford (F) along with Alphabet’s Waymo (GOOGL). While Tesla hypes up its self-driving cars that don’t deserve the name, GM is preparing to deploy fully autonomous vehicles next year. On the battery front, Tesla continues to make claims it can’t back up. Some of its promises, like a semi-truck that can haul 80,000 pounds for 500 miles, may be feasible if battery technology continues to advance at the same rate. Other claims, like charging stations that will give those trucks 400 miles of charge in 30 minutes, appear completely impossible. To achieve the latter goal, Tesla’s charging stations would need a tenfold leap in efficiency. Nevertheless, promises like these would lead one to believe that Tesla has made some significant breakthrough in battery technology, but we cannot find evidence to support that assertion. While the company may have a marginal advantage due to refinements to the production process and the scale of the Gigafactory (if they ever get production running smoothly), experts project the competition to catch up very soon. Tesla’s scale advantage should melt away fairly quickly. Chinese companies are targeting battery factories that would out produce the Gigafactory more than 3 to 1 by 2021. Two former Tesla executives are building their own battery factory with the backing of VW. Without some unforeseen technological breakthrough, it’s hard to see how Tesla can have any long-term competitive advantage around battery production. Its first car, the Roadster, was pushed back from 2007 to 2008 due to production delays. Customers faced long wait times for the Model S due to the company’s struggles in balancing global demand. Currently, Tesla is promising to produce 5,000 Model 3’s a week by the end of June, a number it was originally targeting by the end of 2017. Efforts to deal with Model 3 production problems led to the delay of the debut of Tesla’s electric semi-truck. If Elon Musk can’t hit simple production targets, it’s hard to take his claims of major technological breakthroughs seriously. Elon Musk seems to be promising the moon (and Mars) to distract from Tesla’s ongoing production issues and the fact that its competitors have matched or surpassed them on several fronts. For a time, Tesla had the competitive advantage of being the only quality, semi-affordable electric vehicle on the market. That’s definitively no longer the case, as the Chevy Bolt alone outsold all Tesla models combined last October, and it nearly replicated the feat in November. In a recent head-to-head comparison in Motor Trend, three reviewers compared the Tesla Model 3, Chevy Bolt, and Nissan Leaf: only one person picked the Tesla. The reviewers highlighted certain features, such as one-pedal driving, where the competitors have definitively surpassed Tesla. Notably, the reviewers were comparing the base versions of the Leaf and Bolt, which cost $30-35 thousand, to the fully loaded Model 3 that costs more than $60 thousand. To date, Tesla has not shipped any units of the $35 thousand base Model 3. The number of competing electric vehicles coming out makes you wonder how many people will want to keep waiting a year or more to be able to buy the Model 3. If Tesla can’t fix its production issues soon, it may see its customers abandoning it for cheaper and more accessible options. Longer-term, increased competition should put additional strain on Tesla’s already poor after-tax profit (NOPAT) margins. Reduced pricing power, combined with the eventual end of its federal tax credit, will make the company’s already precarious path to profitability that much more difficult. 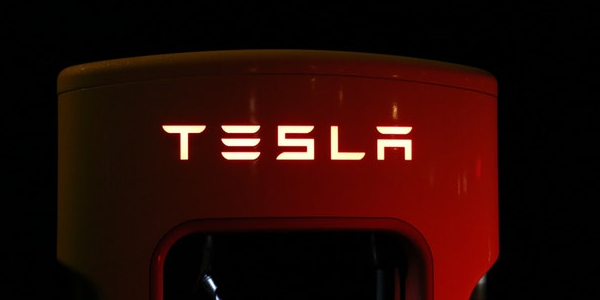 Tesla made headlines earlier this month with a new compensation plan for Elon Musk that the New York Times described as the “Boldest Pay Plan in Corporate History.” Bold is one way to describe the plan, which provides for 12 escalating tranches of stock option grants based on hitting market cap, revenue, and adjusted EBITDA. We would call it foolhardy. Value-Destroying Acquisitions: Tesla has already made one big, value-destroying acquisition with its $7.5 billion bailout of SolarCity. Shareholder Dilution: Employee stock compensation and the SolarCity acquisition has increased outstanding shares by 34% since the beginning of 2015. Earnings Management: Tesla has benefited at times from non-operating income that it doesn’t highlight to investors, and a leaked memo in 3Q16 showed Elon Musk urging employees to cut costs and push production as much as possible to hit GAAP profitability for the quarter. For as much as Tesla hypes itself as being long-term focused, it places great emphasis on short-term numbers. Focus on Distractions Not Operations: Emphasizing the stock price over operational goals incentivizes Musk to spend more time on publicity stunts, such as sending a Roadster to Mars, instead of achieving production targets and profitability. Tesla’s new compensation plan stands in stark contrast to its previous scheme, which required Musk to hit targets around new model releases, production, and gross margins. Executives should be focused on these operational goals, along with efficient capital allocation, instead of constantly trying to pump up the stock price. As Tesla starts to face more competition, it faces a key disadvantage compared to more established automakers. While these incumbents have steady cash-flow streams coming in from their existing business, Tesla loses money as it tries to build up production and sell its cars below cost to attract a customer base. Figure 3 shows how far behind its peers Tesla ranks in terms of trailing twelve months free cash flow (excluding the SolarCity acquisition) and cash on hand. Tesla’s lack of cash flow limits the amount it can invest compared to competitors and makes it more beholden to financial markets. Operational struggles, of which the company has had plenty, can lead to more difficulty attracting capital, which creates a negative feedback loop that amplifies any problems. It’s so self-evident to say that Tesla’s stock is overvalued that even Elon Musk is saying it. No one needs to be told that the stock price reflects enormous growth expectations, but it’s worth quantifying how unrealistic those expectations really are. 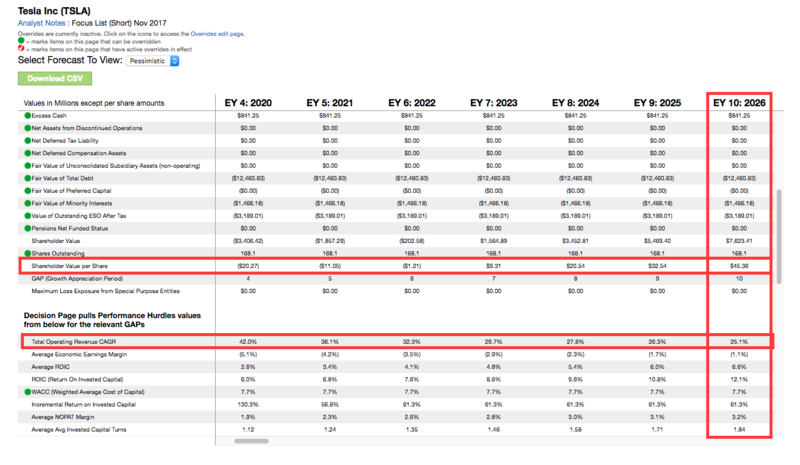 If we assume that Tesla can achieve 8% NOPAT margins (somewhere in between a mass-market and a luxury car brand) within four years, it would still need to grow revenue by 30% compounded annually for the next 10 years to justify its current price of $345/share. Those are ambitious targets for a company with no track record of profitability. If, instead, NOPAT margin tops out at 4% and Tesla grows revenue by 25% compounded annually for a decade, the stock is worth just $45/share today. That’s an 87% downside for what would still be fairly impressive operating results. Any one of these factors could plausibly hit Tesla’s shares over the next several months. Over the past twelve months, TSLA insiders have acquired 211 thousand shares and sold 501 thousand, for a net disposition of 290 thousand shares. These sales represent less than 1% of shares outstanding. Short interest is currently 30.7 million shares, which equates to 28% of shares outstanding and 5 days to cover. Short interest has been steady over the past year, hovering in a range from 35 million to 27 million shares. Though Tesla remains a highly shorted stock, it’s no longer even in the top 50 NASDAQ stocks in terms of short interest as a % of the float. The stability of the short interest over the past year indicates that shorts aren’t too sensitive to price swings, which means a short squeeze isn’t a significant risk. Income Statement: we made $364 million of adjustments, with a net effect of removing $168 million in non-operating expense (2% of revenue). We removed $98 million in non-operating income and $266 million in non-operating expenses, including $22 million of transaction costs from the SolarCity acquisition. 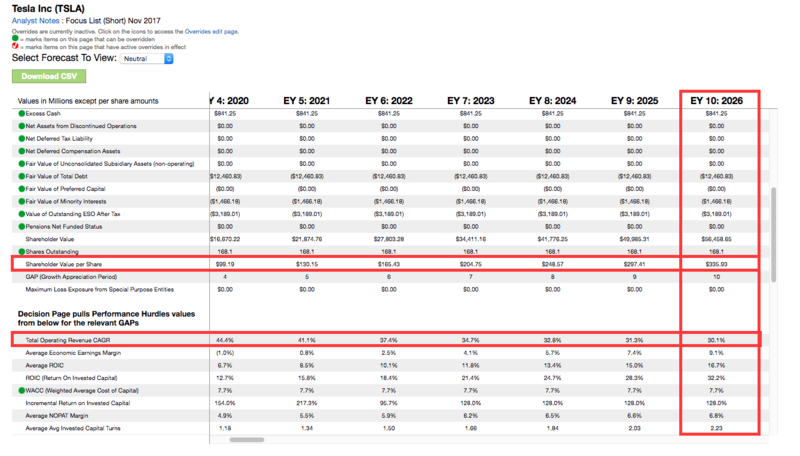 You can see all the adjustments made to TSLA’s income statement here. 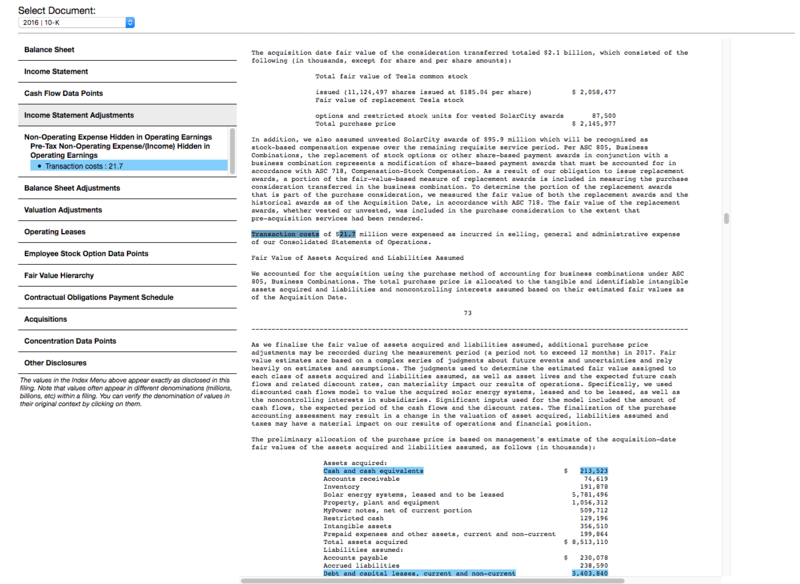 Balance Sheet: we made $6.8 billion of adjustments to calculate invested capital with a net decrease of $2.4 billion. The largest adjustment was a $3 billion midyear acquisition adjustment. This adjustment represented 18% of reported net assets. You can see all the adjustments made to TSLA’s balance sheet here. Valuation: we made $18 billion of adjustments with a net effect of decreasing shareholder value by $16.3 billion. One of our largest adjustments was $3.2 billion to account for outstanding employee stock options. This article originally published on January 29, 2018. 2 replies to "New Exec Comp Plan Means It’s Time to Short this Stock"